Premier Lock 'n Roll 1-Piece Drainable Pouch, Transparent, 2 1/8"
Incontinence Sheath Holder with foam with Velcro®. For male patients using external urinary catheters. Helps to secure a urinary drainage sheath (external male catheter) in place without the use of adhesive. One size fits all. 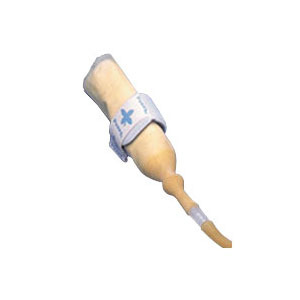 Has catheter strap designed to secure a urinary drainage sheath (external male catheter) for males with incontinence. This product wraps around catheter sheath and fastens with a hook-and-loop closure without the use of adhesive. For male patients with external urinary catheters. Tape free system, Velcro Strap, One size fits all.